There are three types of hamster habitats, and some are safer than others. While an aquarium-style habitat works better to prevent escape, they can have ventilation issues. Plastic habitats can be fun for hamsters and owners, and are usually harder to escape from. Wire cages tend to be the most popular, but there are many dangers associated with this style. Before choosing a habitat for your new pet, you need to consider if the cage style is worth the risk. Hamsters may reach through the wires of a cage to grab at something and get their legs caught. The hamster might panic and break his own limb. Hamsters also like to climb the walls of wire cages; should one fall, his limb might get caught and broken or he might suffer internal injury. Hamsters with broken limbs can be treated, but this is an accident that can be avoided by using an aquarium or plastic-style cage. Due to their ever-growing teeth, hamsters do a lot of chewing. As they chew the wires of a cage, the plastic coating of the wires can come off and possibly choke the hamster. Over time, the hamster may even be able to chew off part of the cage, which could cause internal damage if swallowed. 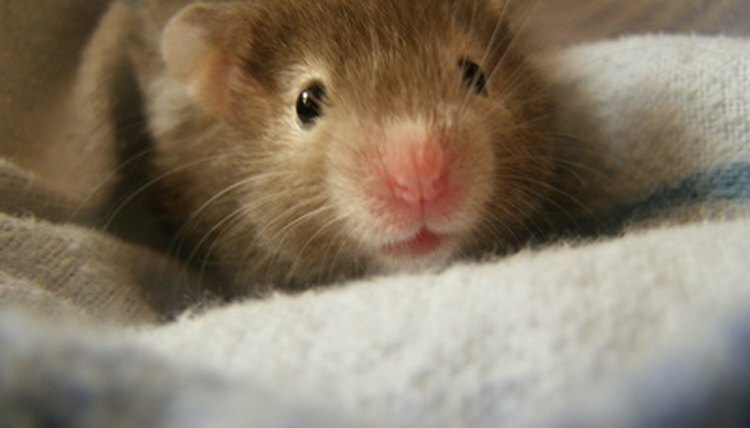 Regardless, chewing on the cage and ingesting the material could be deadly for your hamster. Other types of cages may be made with painted wires. If your hamster decides to chew on these, it can become intoxicated from the ingestion of the paint. Hamsters are intelligent creatures who will spend hours working at a cage door to escape. Wire cages can be simple for a hamster to escape from if they have simple closure mechanisms. Once she does escape, it can take days to find her. In some cases, the hamster may never reappear. Depending on the length of time the hamster is left to run free, she may also be hard to handle afterward. Once she has a taste of freedom, she'll do what she can to escape again, including biting her handler. Providing interactive toys can reduce the boredom in a hamster and take her mind off working on the cage latch. Multi-tiered hamster cages are a popular option. The hamster loves to get up high and owners love to watch the hamster explore. Due to their poor eyesight though, the hamster can fall from the upper levels because they can't properly judge how far the bottom of the cage is. This can lead to broken limps or even death. The good news is there are safer ways for your hamster to get up high without getting harmed. Tubed habitats allow hamsters to crawl into observatories where they can look out and you can look in.